He survives on saline and is no longer conscious. Prajwal is slipping away from us. We take turns to visit the hospital as we cannot afford a room. It's been 20 days. We have been staying in the waiting hall of the hospital. We don't really care about food or sleep - only Prajwal. 12-year-old Prajwal is lying in the hospital bed unconscious for days now. He has already undergone 4 surgeries in a span of just a year and is still striving to live. 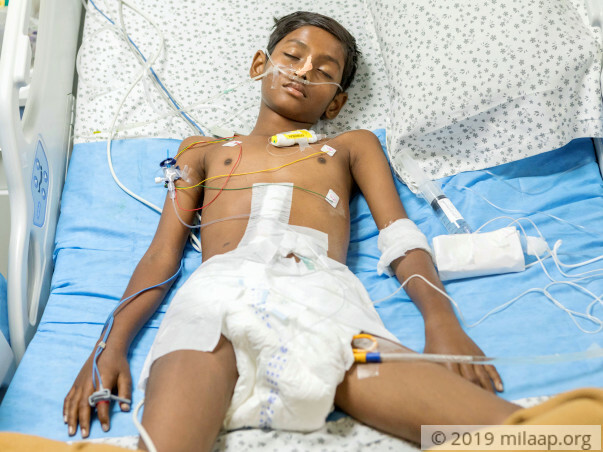 His parents Basavraj and Vijaylakshmi are sitting in the waiting hall of the hospital for a month now waiting for him come out of the ICU alive. Since his early childhood days, Prajwal used to vomit once in a while. The parents mistook it for overeating and digestion problem for a long time. Only in last year July, Prajwal started vomiting unstoppably which was green in color. Tests revealed that the young child has intestinal malrotation, which means there is a blockage in the intestinal tract. Prajwal had difficulty in eating and difficulty in pooping. The doctors said he needed corrective surgeries to remove the blockages. 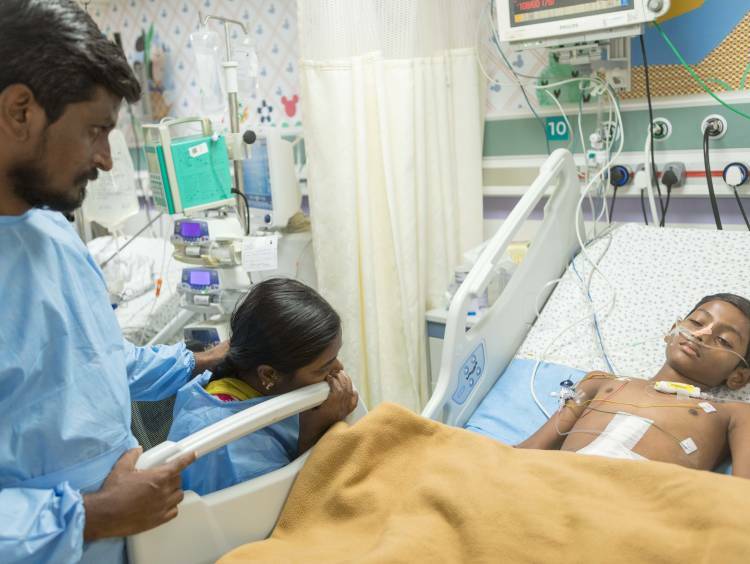 After 9 months of his recovery from surgery, Prajwal complained about severe stomach ache in March. Soon the vomiting started again. It was green again. Nothing was passing through his intestine, not even bile. When he wakes up, he tells us that he cannot take it anymore. It feels like he is asking us to let go. My son wants to grow up and be a doctor to help others like himself. He wants to go to school. I will not let this disease take his dreams from him. Basavraj is an electrician from Bangalore. 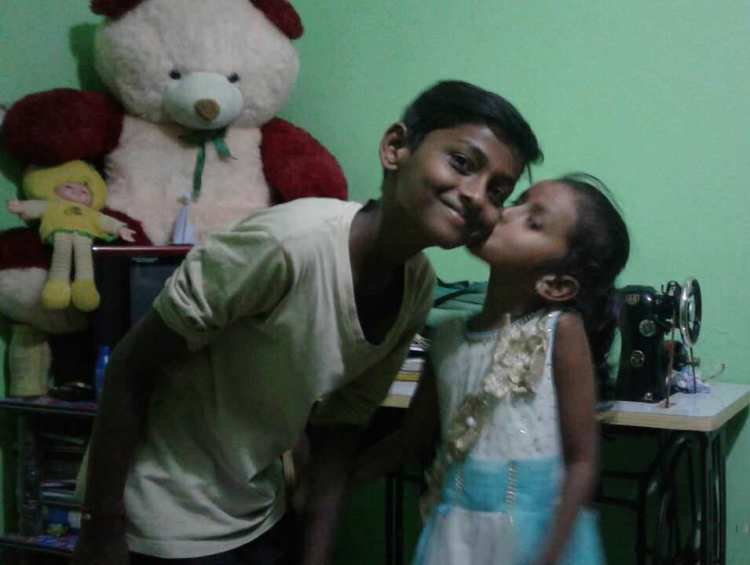 Vijaylakshmi spends most of her time taking care of Prajwal, 9-year-old Praveen, and 7-year-old Prakruti. Whatever little time she is left with she engages in tailoring job so that she can add a little income to the family. 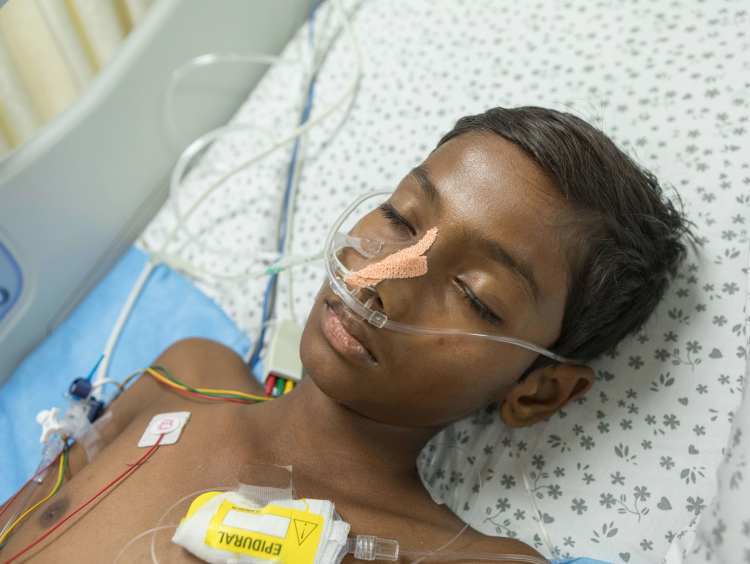 The cost of saving Prajwal now is Rs 5 lakhs and he’ll not make it without the intensive care. His parents just exhausted Rs. 3 lakhs on ICU care for the past two weeks. They know they are running out of time. Ifhe does not stay in the ICU for a few weeks, Prajwal's stools will end up poisoning him to death. 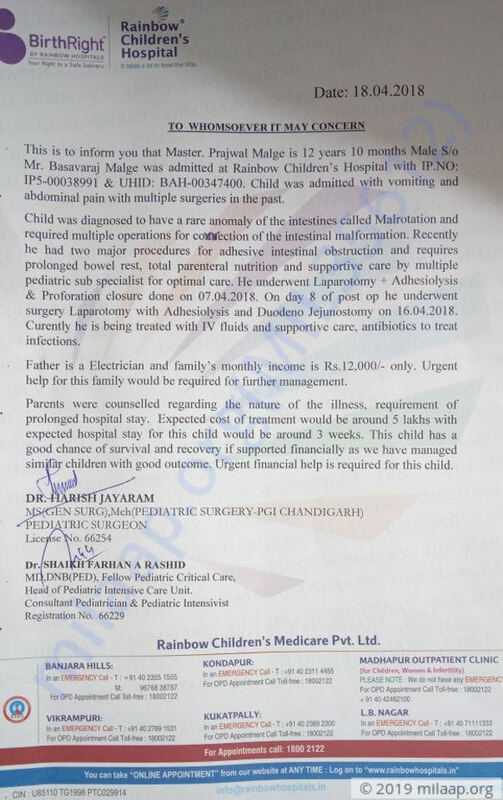 Your contribution can help this young man beat this dreadful disease and grow up to be a doctor. Prajwal was discharged from the hospital and he is recovering gradually at home. he is under strict liquid diet and he need to undergo a tube change every two months which has bee installed to feed him. Doctors have suggested a period of 3 years for him to recover completely. I'm really thankful to each one of you for the love and support which you have shown towards him, shall keep you all posted. Prajwal was discharged from the hospital 2 days back and he's currently at home. He's doing well now and there has been significant improvement in his health. The intestinal blockage has also faded but the doctors have advised him to stay strictly on liquid diet for the next three months. This is a great progress from him and I, and my family is extremely happy to finally have him at home. We thank each one of you for the love and support which you have shown towards him and we will always be grateful to each one of you. 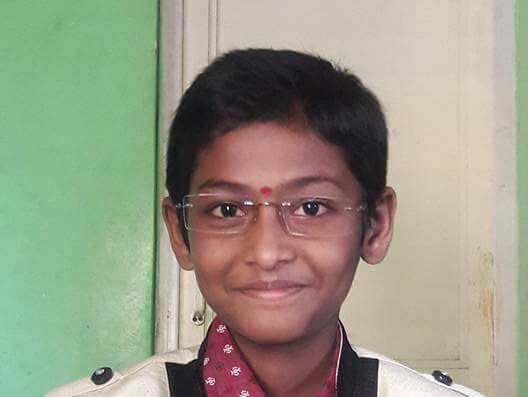 As of now, Prajwal is doing well and there has been significant signs of improvement in his health. 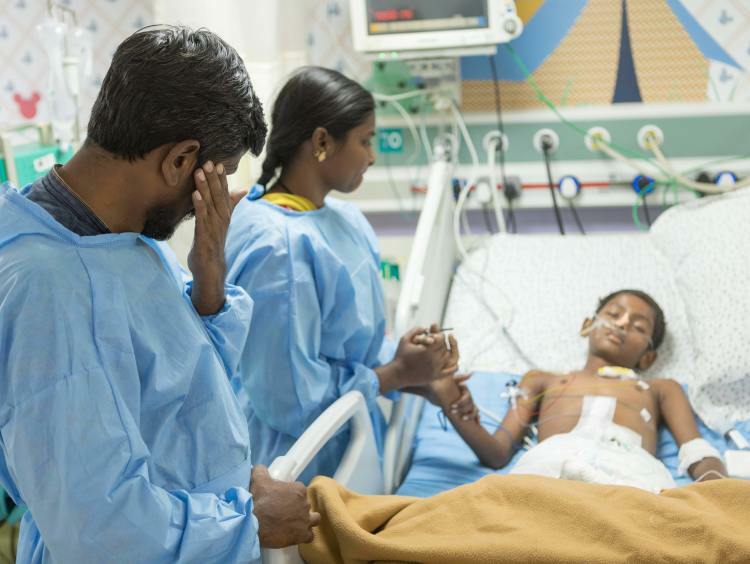 He has been shifted from ICU and the blockage in his intestines has also reduced considerably with the help of medication. Currently, he's kept on a strict liquid diet and he will be kept on the same until the blockage completely fades. He has lost weight in the treatment but it's a relief for us to finally see him active and out of ICU. This wouldn't have been possible without the support of you all, I and my family thank each one of you for the love and support which you have shown towards us.